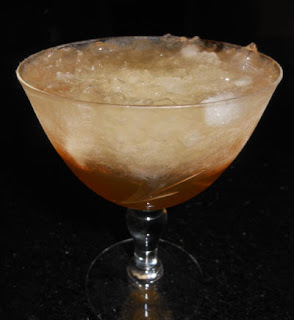 Stir with ice and strain into a wine glass filled with shaved ice. Garnish with berries (omitted). One drink that has always captivated me due to the name was the Symphony of Moist Joy from the Waldorf-Astoria Bar Book; however, one of the ingredients, crème de rose, is rather hard to source. I did try to acquire a bottle of Crispin's Rose Liqueur made out of the Germain Robin distillery and was willing to pay the $85 for the half bottle, but they do not sell the product outside of California and I cannot have liquor sent to me easily here in Massachusetts. Later versions of this drink substitute grenadine in place of the crème de rose, but that seems like an uninspired substitution. After trying out a craft rose syrup, I figured that could split the difference between the rose liqueur and grenadine recipes with this syrup and decided to give the recipe a go. I also opted for the mixed version instead of the Pousse-café recipe, for the sum of the parts seems more interesting to me than each individual layer on its own. The crème de menthe played a major role in the aroma department, and this mintiness carried over into the sip along with the rose flavors and into the swallow along with the other herbal notes. Since the crème de menthe played such a large role in the drink, I recommend using the best one that you can find for this recipe. A much more interesting name than the Liquid Symphony!